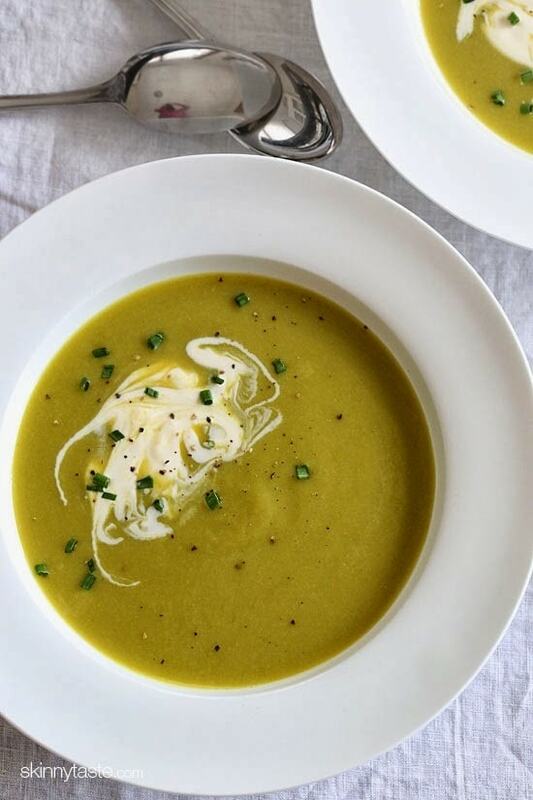 Cream of asparagus with the addition of leeks, a relative of onions, scallions and shallots, topped with a dollop of creme fraiche makes this one of my favorite Spring soups. The combination brings a wonderful subtle flavor and a creamy delicious finish. Keeping things green today in the spirit of St Patrick’s Day! More of my favorite creamy soups are Dad’s Creamy Cauliflower Soup, Creamy Carrot Ginger Soup, and Instant Pot Tomato Basil Soup. My daughter Madison loves helping me in the kitchen, here I let her snap off the tough ends of the asparagus – she’s a pro! Creme fraiche is wonderfully creamy, and a bit thinner than sour cream. If that’s not available near you can swap it for sour cream or even Greek yogurt. 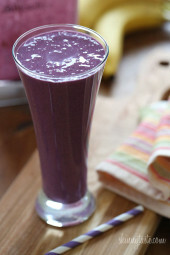 If you want to go dairy-free, you can of course leave it out, it will still taste wonderful. Enjoy! 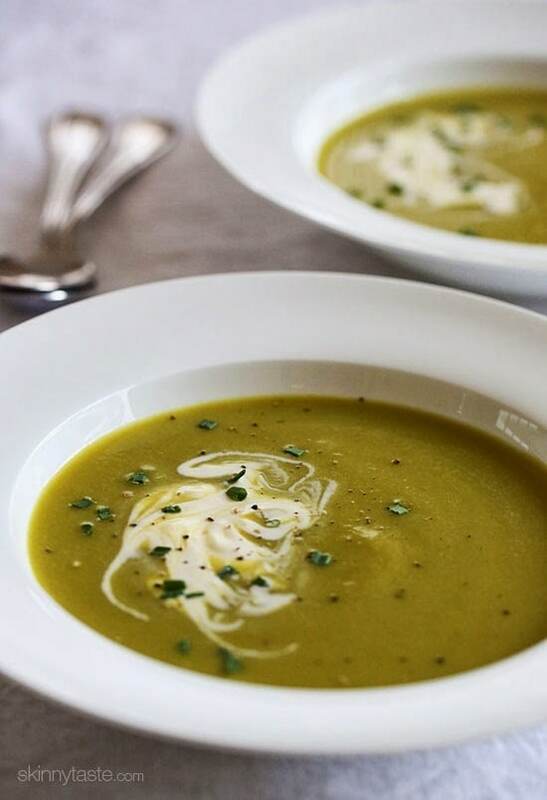 Cream of asparagus with the addition of leeks, a relative of onions, scallions and shallots, topped with a dollop of creme fraiche makes this one of my favorite Spring soups. In a large heavy pot, melt better over medium-low heat. Add leeks and cook, stirring occasionally, until the leeks are soft, about 8 to 10 minutes. Add garlic and cook 1 minute, or until fragrant. 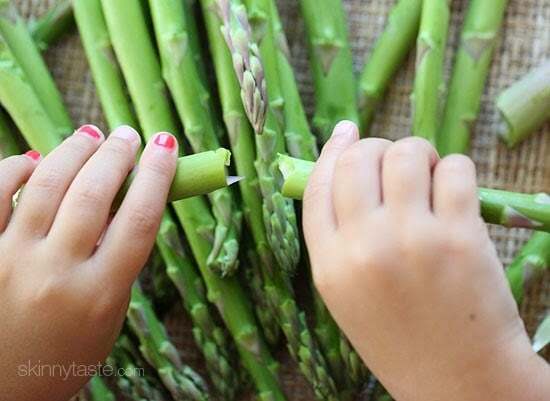 Chop the asparagus into 2-inch pieces. Add to the pot with the leeks. 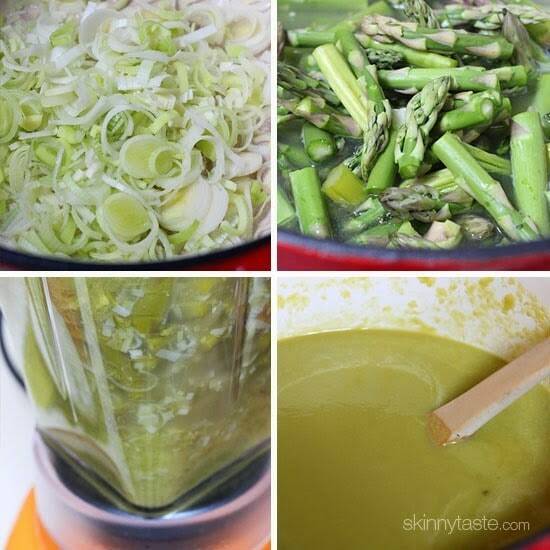 Cover and cook about 20-25 minutes or until asparagus is very tender. Remove from heat and puree until smooth with a blender. To serve, divide in 5 bowls and spoon in 1 teaspoon Creme Fraiche and chives for garnish. Just made this today and its absolute perfection !!!!! I squeezed some fresh lemon juice before serving .. Thank you so much Gina !!! My 9 yo LOVES this and so does our entire family. One of our favorites! What is meant by “32 oz container” in the ingredients list? Is this literally a 32 oz container, or is this meant to be 32 oz of a particular ingredient – I’m confused! Wait, I get it! It’s 32 ounces of broth plus another cup worth of broth. Okay! 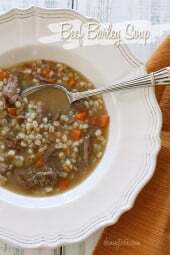 I love this recipe and am going to make the soup today. I was wondering if I could add avocado ti it right before blending. What do you think, Gina? This was DELICIOUS! Making a 2nd batch. Has anyone tried freezing this?? Making it again tonight – its terrific even my 8 year old gobbles it up! Is there anyway to lower the sodium content?? My Dr. says I need to cut out salt. I love soup but why is sodium so high? I would love to make this! Any suggestions? This soup was delicious, I made it last night!!! This soup is delicious. I used one large leek and it was perfect. it says 4 leeks….ive never used leeks before,but the ones i have purchased seem big…should i use all four stalks? This soup was so good! Got my asparagus on sale for 99 cents a lb which made iteven better. Thanks so much for all the tasty recipes. I do the fast diet and i can always count on your site for wonderful low calorie dinners!!! Your soups are always amazing. Made this last night…I wasn't sure if I would really like this but had to try this because of its simplicity. The taste was amazing!!!! I can't believe that a few ingredients can turn up such a great soup. This will definitely be made again. I added the juice of one lemon to this recipe and it really made the soup bright and delicious. I would suggest it! Another great recipe, Gina! This is very yummy and delicious. Thank you. I didn't know what "creme fraiche" was until tonight! Thanks for the education, this creme is delightful. Just made it tonight and it is divine! Next time I'll go a little easier on the garlic, I put too much because I like garlic. But wow!! Thank you for this recipe, it is definitely a keeper. Gina, You usually recommend an immersion hand held blender when preparing these kinds of soups. Does that not work well with this recipe? Okay, I made this the other day and it was delicious! No crème fraiche in my grocery store (that I could find) and though I bought sour cream, we didn't use any. We used the immersion blender to blend it all up and it works perfectly. I did good the asparagus for a little longer than suggested (maybe 5 minutes) because I really wanted the immersion blender to work without leaving stringy pieces behind. It was great though! This soup looks delicious!! I am so excited for spring to arrive with all its tasty veggies. If people want to make their own it's the easiest thing ever to make creme fraiche! I get cultures from http://www.culturesforhealth.com/starter-cultures/other-starter-cultures.html (no i don't work for them haha) and it's so easy! and delish! in fact i was thrilled to see this recipe because i usually have more creme fraiche than i know what to do with- so i use it to make ranch dip. Thanks! just wondering if plain greek yogurt could be a good substitute for the creme fraiche? i'm trying to incorporate as much greek yogurt into my day as possible. thanks! Oh my, I love this! 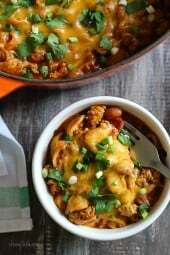 Soup is a favorite meal of mine, and this looks so light but comforting! I need to try creme fraiche, it sounds dreamy! This looks amazing. Asparagus soup is always a special treat for me when out. Never thought to make it at home. Adding this to the list for the weekend. Sorry, you swirl in 1 teaspoon per serving at the end. It's actually Creme fraiche. It's a type of cream, sort of like sour cream. She does mention you can sub sour cream or greek yogurt if you don't have it. Correct, it's creamier than sour cream and easily spoonable, but if it's not available use sour cream. Beautiful soup that must be made soon. I love your addition of Creme Fraiche. Thanks for the recipe. Looks delicious! The beginning of the post mentions the addition of shallots and scallions, although I don't see them in the recipe. Would you mind adding in the quantities for those? Thanks very much! Oh. I affixed the "shallots and scallions" to the wrong part of the sentence I guess! Thanks! Ooh, this looks like something I'll definitely make when asparagus starts popping up in my corner of the world!